San Luis Obispo County’s Lopez Dam near Arroyo Grande is a “high-hazard” reservoir, according to an recent assessment conducted by the state of California. Earlier this year, the Oroville Dam’s primary spillway suffered damage and began to erode. Then the emergency spillway failed which prompted evacuations of more than 180,000 Northern California residents. Failures at the Oroville Dam prompted the California Division of Safety of Dams to reevaluate large spillways at high-hazard dams. The agency determined Lopez Dam may have potential geologic, structural or performance issues with its spillway, according to a letter from the Division of Safety of Dams to the San Luis Obispo County Flood Control District. The state agency has reportedly identified more than 50 “high-hazard” dams in California. Whale Rock Reservoir near Cayucos is reportedly on the list, as well. State officials are requesting that SLO County perform a comprehensive assessment of Lopez Dam’s spillway as soon as possible. The assessment should include an evaluation of the concrete lining, the existing drainage system and the potential for slab undermining and hydraulic jacking. Dam safety official say they may also require a spillway site investigation. The investigation should focus on identifying potential geologic hazards associated with the spillway, including foundation materials beneath and adjacent to the spillway, as well as their susceptibility to erosion and instability. The state is ordering the county to submit a work plan by September 1. Dam safety officials say any damage to Lopez Dam’s spillway must be repaired before the next flood season. Not sure what the big deal is- The Supervisors have told us the Flood Control District has plenty of money. I am sure the residents around this Dam appreciate Lynn and the others insisting that their money could pay for the Paso Basin. Wonder if north county folks will line up to send money to Lopez as a thank you? The flood control district has managed every big county water project from Lopez to Nacimiento to Lake San Antonio and I don’t recall anyone complaining then – because we all benefit, and we all get our share. This whole business about the Paso Basin is nothing more than a ruse by Adam Hill and Bruce Gibson who are in cahoots with the Resnicks to set up districts that they can gain control of to line their pockets. It will be infinitely less expensive for now and the long term if we allow the County to do its job and manage the basin because by so doing we will keep control of our water for our own people instead of for the benefit of a select corrupt few business moguls and politicians. So what does this announcement do, immediately, to property values of those who live downstream? How much did we tax payers just pay in this century to drive piles of concrete into the dam because some “Chicken Little” said it wouldn’t be safe in an earthquake? Lopez Canyon wasn’t even dammed until the late ’60s. It sure is easy to tell people to spend more of their money, “because I say so”. Do you actually live downstream from one of these dams? It is all water under the bridge now. That’s holds water like Hitler was an exception we can forget. Never devalue life, water. 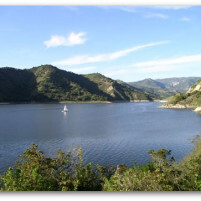 The Salinas Reservoir (Santa Margarita Lake) was a WWII excuse to build for Camp San Luis (really San Luis Obispo growth previously not possible due to the lack of water). It was built from concept to finish in less than a year but never completed to the extent of the application, (project has never been licensed). The low lying areas of South Atascadero had evacuation orders (approx. 1943) due to a crack in the dam which was later determined to be a none issue. Although this dam has never been completed, raised another 19 feet after the steel gates are slipped into place, does the State want to discuss this or has San Luis Obispo placed blinders (threat of litigation) on the State (wink wink)? SLO’s growth was not constrained by a lack of water in the 1930s and 1940s. It wasn’t the mecca that so many SoCal and NorCal refugees now flock to. In the 30’s and 40’s the mecca was just California. The dam was built 1968-69 and retrofitted in 2001-2. Who did the retrofit? Please, God, don’t let it be Wallace who does the next stage. Our lives are in his hands, our money is in his pocket. Wallace was involved in the fort stage in 2001 along with him compadre Pavo Ogren. You can google endless reports on the study of Lopez dam and how it was inspected and signed off as A OK. So what happen, Ca trying to find yet another way to bilk us out of money?